These panels (P02838, P02839, P02840), along with a fourth one in a private collection, illustrate the Story of Nastagio degli Onesti, the eighth novel of the fifth day of Boccaccio´s Decameron. This is the story of Nastagio, a young man from Ravenna who was rejected by the daughter of Paolo Traversari and abandoned the city to settle on its outskirts. 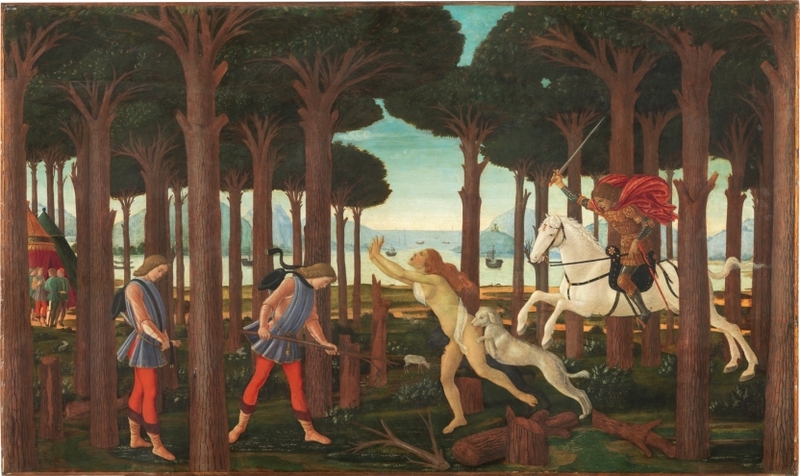 This first panel shows Nastagio taking leave of his friends to enter a pine forest, where he sees a woman being attacked by mastiffs and pursued by a man on horseback. That man, Guido degli Anastagi, tells him that he, too, loved a young woman who didn´t care for him. Her rejection led him to suicide, but the young woman was unmoved by his death. When she, in turn, died, she was condemned to hell for her indifference. There, they were punished with this persecution, which was to be repeated every Friday for a number of years equal to the number of months the young woman had ignored him. Each time Guido caught the young woman, he was to rip out her heart and throw it to his dogs. These paintings were commissioned in 1483 by Antonio Pucci for the marriage of his son, Giannozzo, with Lucrezia Bini. The coats of arms of both families flank those of the Medici on the third panel. Specialists see Botticelli´s hand in the overall design and in certain figures. They also detect the participation of his assistants, Bartolomeo di Giovanni and Jacopo del Sellaio. Height: 82.3 cm. ; Width: 139 cm. Vasari, Giorgio (1511-1574), Le Vite de Piu Eccellenti Pittori,Scultori Ed Architettori.V..., G.C.Sansoni, 1873, pp. 312. 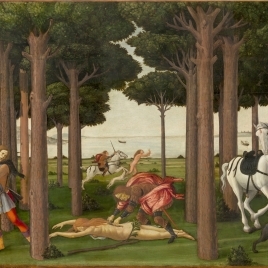 Plunkett, Count, Sandro Botticelli, George Bell and Sons, 1900, pp. 102. Berenson, Bernard, Alumno di Domenico, The Burlington Magazine, 1, 1903, pp. 11. Cartwright, Julia, The life and art of Sandro Botticelli, Londres, 1904, pp. 125. Reinach, Salomon, Repertoire de Peintures du Moyen Age et de la Renaissance. 1, III, Ernest Leroux, 1905, pp. 734. Reinach, Salomon, Repertoire de Peintures du Moyen Age et de la Renaissance. 1, III, Ernest Leroux, Paris, 1905, pp. 734. Diehl, Charles, Botticelli, Librairie Plon, 1907, pp. 100. Rusconi, A.J., Sandro Botticelli, Instituto d'arti grafiche, 1907, pp. 73. Crowe, J. A(Joseph Archer), A new history of painting in Italy: from the II to the XVI, J.M.Dent and CoE.P.Dutton and Co, 1908, pp. 422. Venturi, Adolfo, Storia dell' arte italiana, I, U. Hoepli, Milán, 1911, pp. 592. Isacker, K.Van, Anvers. Douze Siecles D'Art et D'Histoire, Fonds Mercator, Paris, 1926, pp. 101. Arsene, Alexandre, Botticelli, París, 1929, pp. 52. Yashiro, Jukio, Sandro Botticelli, Londres, 1929, pp. 292. Brion, Marcel, Botticelli, Les Editions G.Cres & Cie, 1931. Marle, Raymond Van, The development of the Italian schools of painting, XII, Martinus Nijhoff, La Haya, 1931, pp. 216. Mesnil, Jacques, Botticelli, Albin Michel, Paris, 1938, pp. 222. Tormo, Elías, Estudios de Botticelli de España, Boletin de la sociedad española de excursiones, 46, 1942, pp. 1. Sánchez Cantón, Francisco Javier (1891-1971), La colección Cambó, Alpha, Barcelona, 1955, pp. 44. Salvani, Roberto, Tutta la pittura del Botticelli, Rizzoli, Milán, 1958, pp. 70. Berenson, Bernard1865-1959, Italian pictures of the Renaissance: list of the principal a, I, Phaidon, Londres, 1963, pp. 36. Christie's forthcoming sales, 1967, pp. 7. Montesa, Marqués de, Heráldica en el Museo del Prado, Arte Español / Revista Española de Arte, 25, 1967, pp. 84. Bo, Carlo, La obra pictórica completa de Botticelli, Noguer, Barcelona Madrid, 1970, pp. 36. Rizzatti, Maria Luisa, Botticelli, Editorial Marin, Barcelona, 1978, pp. 24,42. Lightbown, Ronald, Sandro Boticelli, Paul Elek, Berkeley-Los Angeles, 1978, pp. 47. Museo Nacional del Prado, Museo del Prado: pintura italiana anterior a 1600, Gredos, Madrid, 1979, pp. 41-44. Wyzewa, T., Le mouvement des arts en Allemagne e Anglaterre et en Italie, Gazette des Beaux-Arts: La Chronique des Arts., 99/00, 1982, pp. 263. Museo Nacional del Prado, Museo del Prado: catálogo de las pinturas, Museo del Prado, Madrid, 1985, pp. 75-76; 144. Horne, Herbert P., Alessandro Filipepi commonly called Sandro Botticelli painter of Florence, Estudio per edizioni scelte, Florencia, 1986, pp. 127-135. Colección Cambó, Ministerio de Cultura, Madrid, 1990, pp. 211-222. Doce artistas de vanguardia en el Museo del Prado:Saura, Bar, Mondadori, Madrid, 1990, pp. 182. González LLacer, Jordi, El vasto legado de Cambó. El coleccionismo planificado, Galería Antiquaria: Arte contemporáneo, antigüedades, mercado, coleccionismo, 9, 1991, pp. 45. Scott, Barbara, Letter from Paris. The Musée des Tissus in Lyons, Apollo, 134, 1991, pp. 280-282. Alberti, R., Mirar un cuadro en el Museo del Prado, R.T.V.E. y Lunwerg Editores, Madrid, 1991, pp. 28,29. Buendía, José Rogelio, El Prado. Colecciones de Pintura, Lunwerg Editores, Barcelona, 1994, pp. 232. Museo Nacional del Prado, Museo del Prado. Inventario general de pinturas. Nuevas Adquisiciones. Museo Iconográfico. Tapices., Museo del Prado, Espasa Calpe, Madrid, 1996, pp. nº1720. Didi-Huberman, Georges, Ouvrir Venus : nudité, rêve, cruauté, Gallimard, Paris, 1999, pp. 64-85 IV-VII. Museo Nacional del Prado, Pintura italiana del Renacimiento: guía, Museo del PradoAldeasa, 1999, pp. 41. Rubin, Patricia Lee, Renaissance Florence : the art of the 1470s, National Gallery, 1999, pp. 138-139. 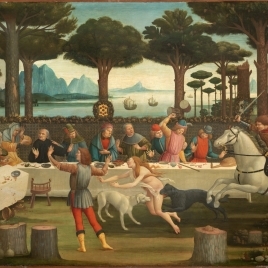 Cast, D., Boccaccio, Botticelli y la Hª de Nastagio degli Onesti. En Historias inmortales, Barcelona, 2003, pp. 71-85. Bartolomeo di Giovanni : collaboratore di Ghirlandaio e Bott..., Polistampa :, Firenze, 2004, pp. 30-31. Botticelli e Filippino : L'Inquietudine e la Grazia Nella Pi..., Skira, Milano, 2004, pp. 102-105. Yarza, Joaquín, 'El Decamerón y la historia de Nastaglio degli Onesti de Botticelli' en: Historias mortales: La vida cotidiana en el arte, Galaxia Gutenberg, Barcelona, 2004, pp. 139. Cecchi, Alessandro, Botticelli, Motta, 2005, pp. 202, 218-219/206-213. Zöllner, Frank, Sandro Botticelli, Prestel, Munich, 2005, pp. 223. Körner, H., Botticelli, Dumont, 2006, pp. 277-282 / 172-175. Museo Nacional del Prado, El trazo oculto: dibujos subyacentes en pinturas de los siglos XV y XVI, Museo Nacional del Prado, Madrid, 2006, pp. 138-147. Enciclopedia del Museo del Prado, IV, Fundación Amigos del Museo del Prado, Madrid, 2006, pp. 1289. Rubin, Patricia Lee, Images and Identity in fifteenth-century Florence, Yale University Press, 2007, pp. 229-271, 360-362 / 213-216. Art and love in Renaissance Italy, Metropolitan Museum of Art: Yale, 2008, pp. 300-303. Musacchio, Jacqueline Marie, Art, marriage, and family in the Florentine renaissance pala..., Yale University Press, 2008, pp. 13. Botticelli to Titian : two centuries of italian masterpieces..., Szépmuvészeti Múzeum, 2009, pp. 99-111. Botticelli. Likeness, myth, devotion:, Hatje/Cantz, 2009, pp. 36 / 23. Bayer, A, El amor y el arte en la Italia del Renacimiento, Numen, nº 7, 2009, pp. 28-33. Garrard, Mary D., Brunelleschi' s egg. Nature, art, and gender in Renaissance..., University of California Press, 2010, pp. 98. Ghirlandaio y el Renacimiento en Florencia, Ghirlandaio y el Renacimiento, Museo Thyssen-Bornemisza, 2010, pp. 136-139. Luque Lacaze, Alejandra, La belleza física de la Dama en el decamerón de Boccaccio, Boletín de arte, 32-33, 2011-2012, pp. 390-392. Blanco, Miguel Angel, Historias naturales: un proyecto de Miguel Ángel Blanco, Museo Nacional del Prado, Madrid, 2013, pp. 52-55, 119. G. Navarro, C.; Perdices, A., La mirada del otro: escenarios para la diferencia, Museo Nacional del Prado, Madrid, 2017, pp. 51 n.7-9. Inv. Nuevas Adquisiciones (iniciado en 1856). Núm. 1720. Catálogo Museo del Prado, 1942-1996. Núm. 2838.